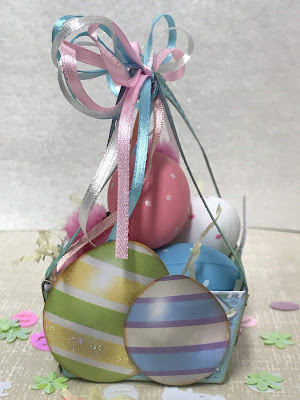 I love Easter for the kids, with the little footprints on the floor and all the bits of fluffy tail bits that Easter Bunny leaves everywhere.. 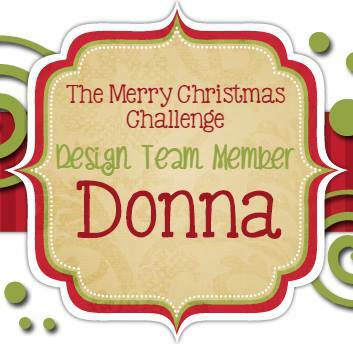 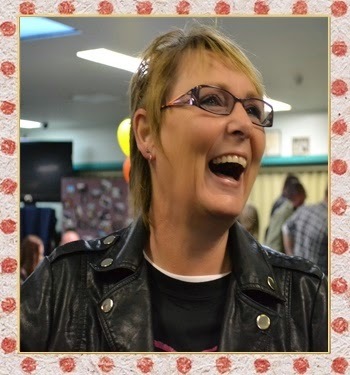 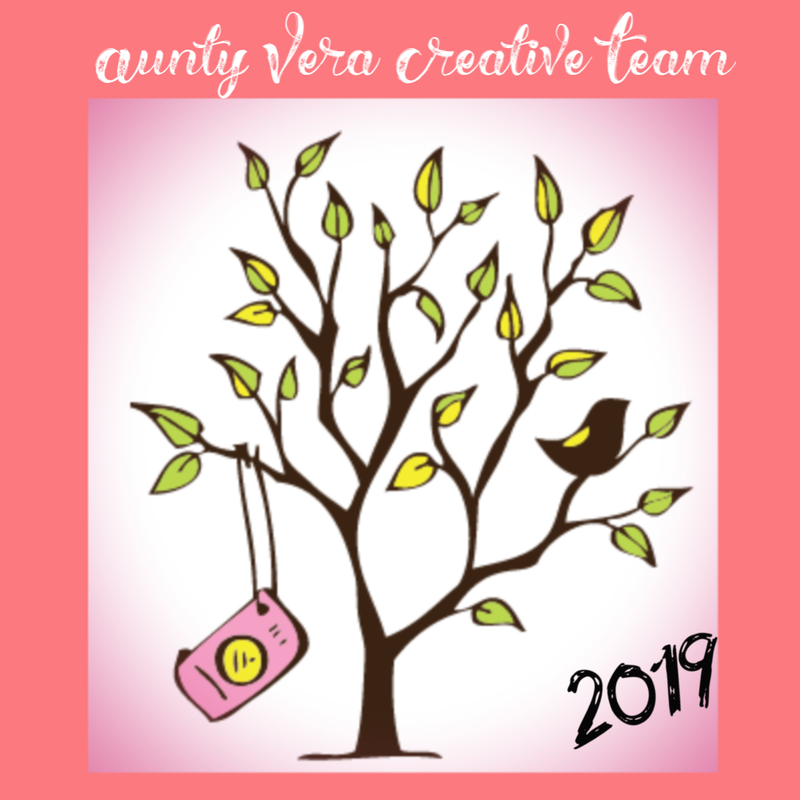 This month we have a wonderful lot of goodies from Aunty Vera and look at what this month theme is called.. 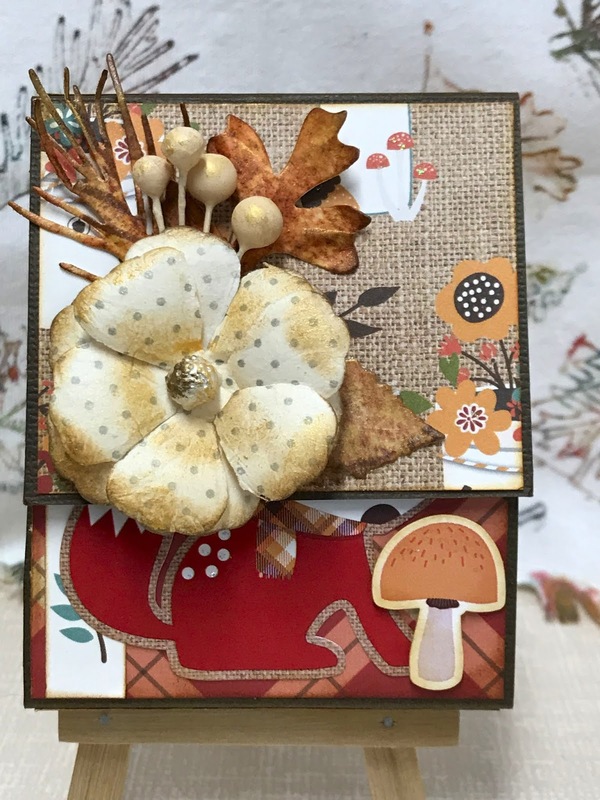 The Life Within The Seed!!. 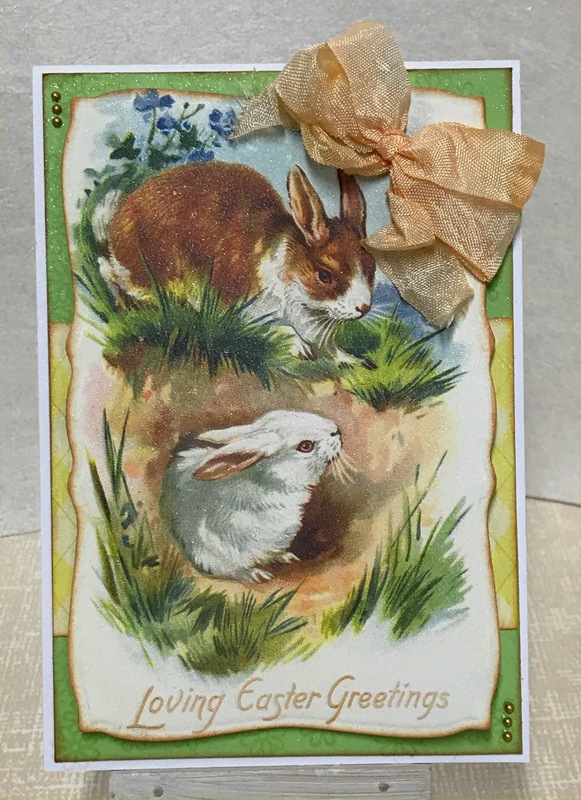 How appropriate for Easter.. 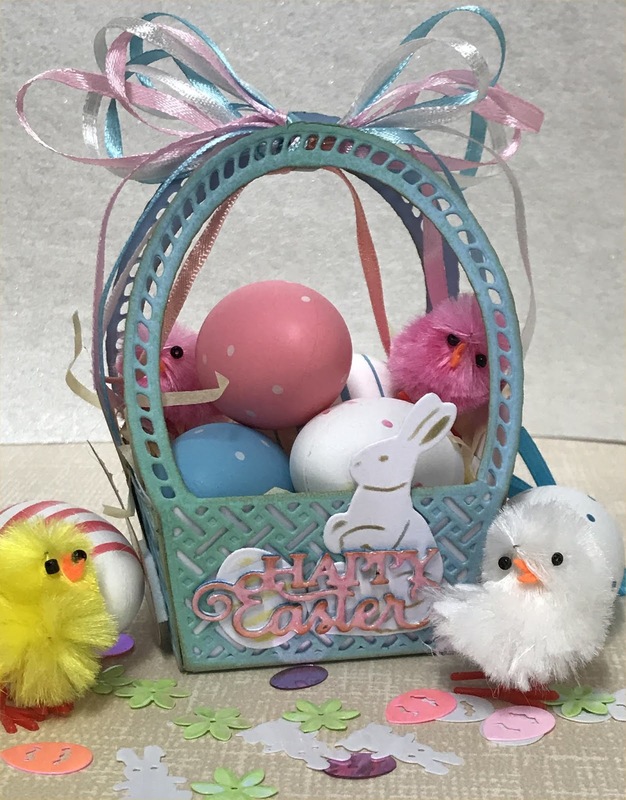 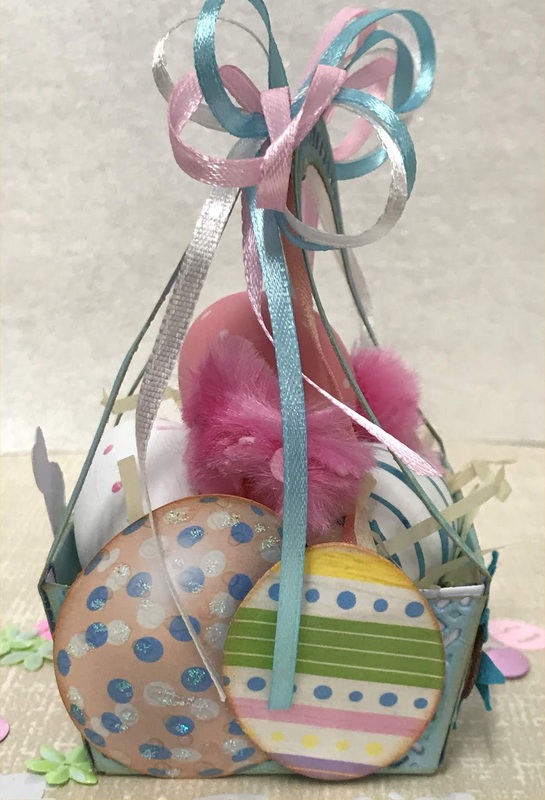 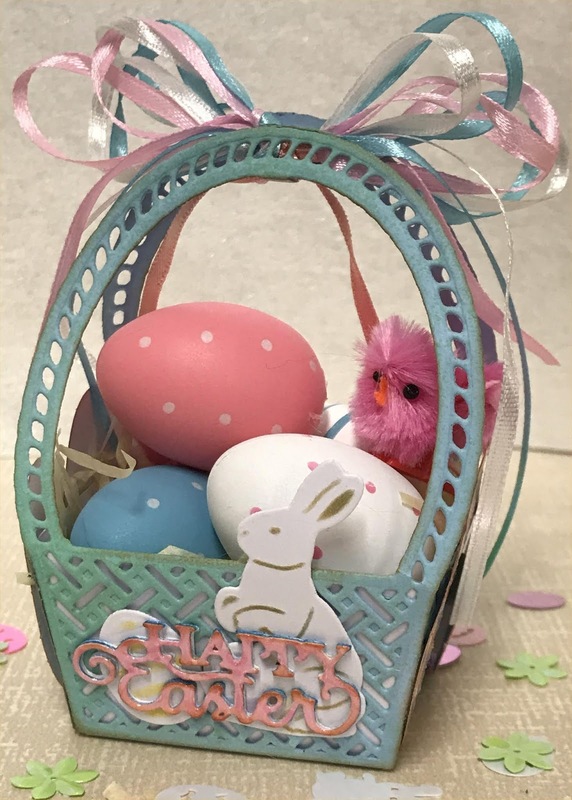 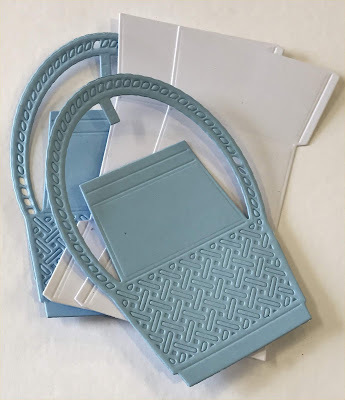 I created this little Easter basket from the Kinetics - Easter Basket die from Creative Expressions..
You will need the three pieces of the die as shown in photo. 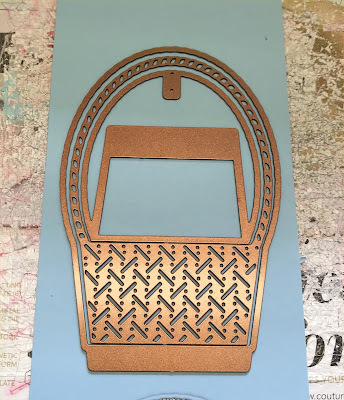 You will need to cut two of the bases and four of the baskets. I lightly sprayed the basket pieces with the Distress Oxide Cracked Pistachio. 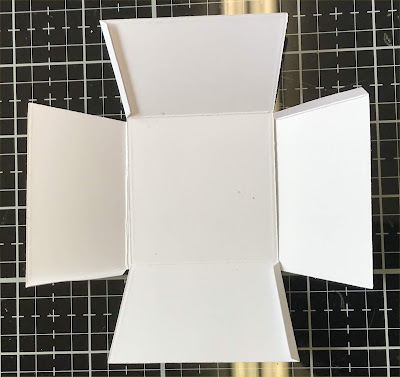 Add adhesive to the basket bottoms and fold over into the box as shown. 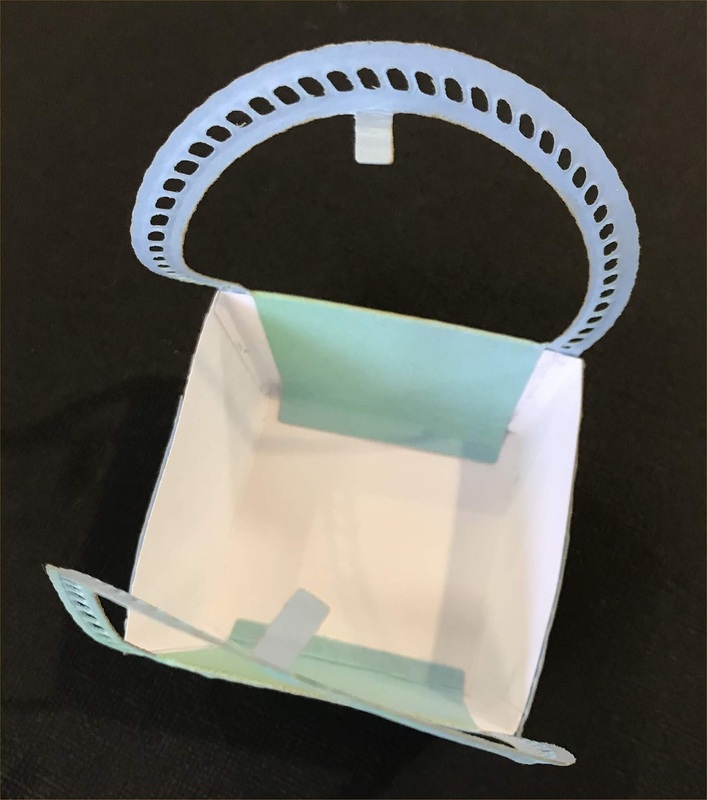 Glue the the bottom tab of the basket under the box and add the sides which have had the handles cut off .. adhere the little tabs together on the handles. 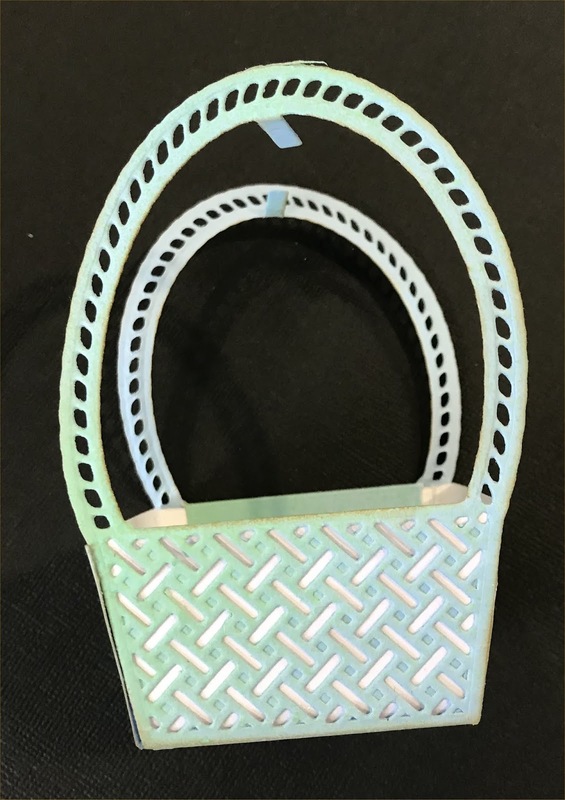 Loop some ribbon and adhere in the space between the handles.. 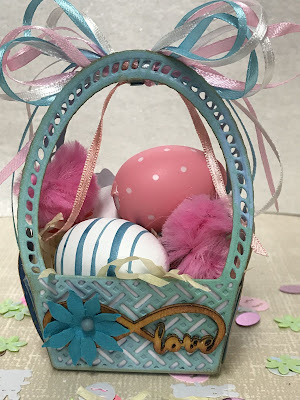 Pop two eggs on the sides using 3D foam tape..
With the back of the basket I simply inked around the wooden flourish with Distress Tea Dye ink and adhered with a small flower from my stash. I die cut a white rabbit and egg, sponged a little ink onto it while still in the die and added it to the basket with 3D foam tape.. I die cut Happy Easter four times and adhered together with the pink layer on top and it was done..
A few Easter eggs and some little chicks and it was done.. How cute is this basket..
You get a great discount on all products used by the Creative team this month..
and check out the group to see everything the Creative Team will be creating throughout March.. 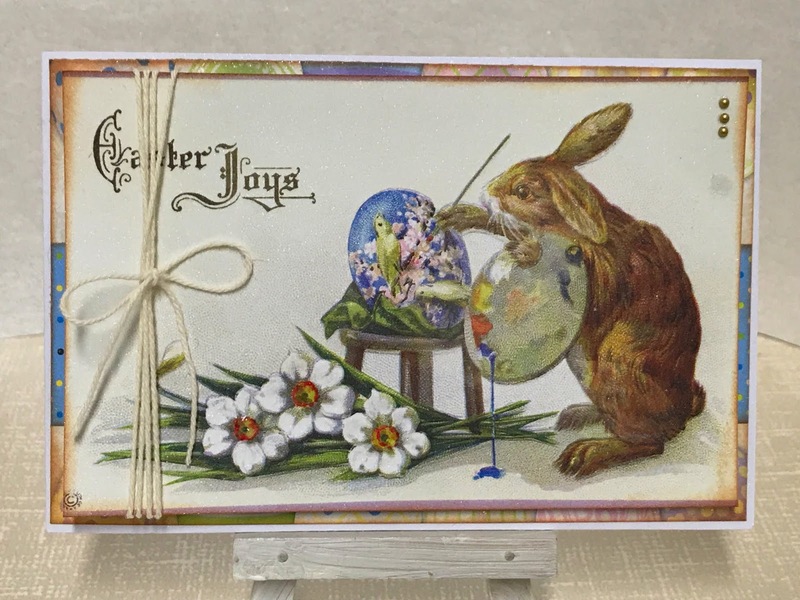 I love Easter and Flowers and what it means; when Aunty Vera chose this months theme heading I thought it was so appropriate of what Easter is.. A new beginning.. 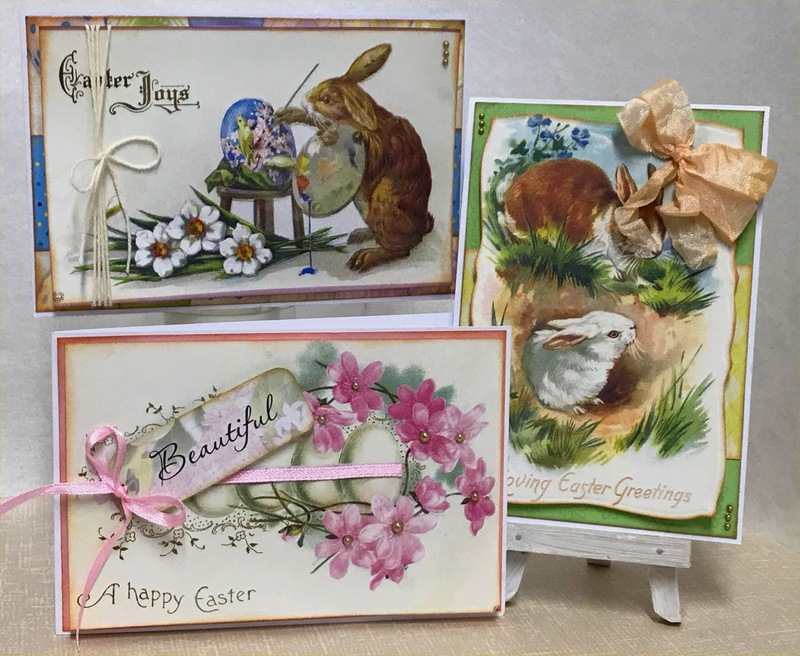 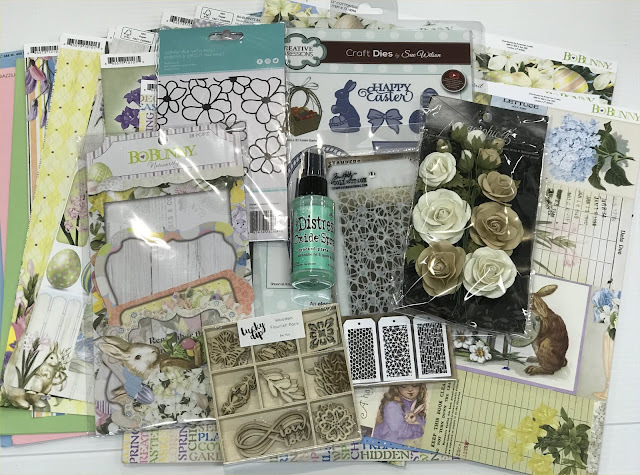 I just loved these cut aparts from the Bo Bunny Cottontail cardstock so much ,that I didn't want to cover them up with anything really as the designs are wonderful.. So I simply backed them with cardstock from the kit, added a little ribbon or twine, some sparkle and it was enough.. I placed the cut-aparts on a 3D backing to give some dimension on all three cards and added three tiny pearls.. I sprayed all of these with Glimmer Mist to give a little sparkle and they were finished..
Again very simple but pretty..
See they look wonderful together and look rather old fashioned.. 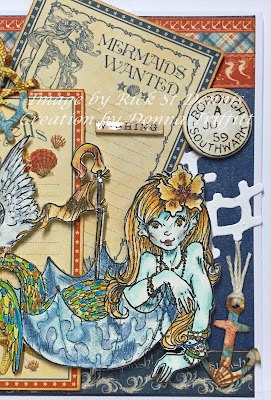 I love this set of digital images by Rick St Dennis. 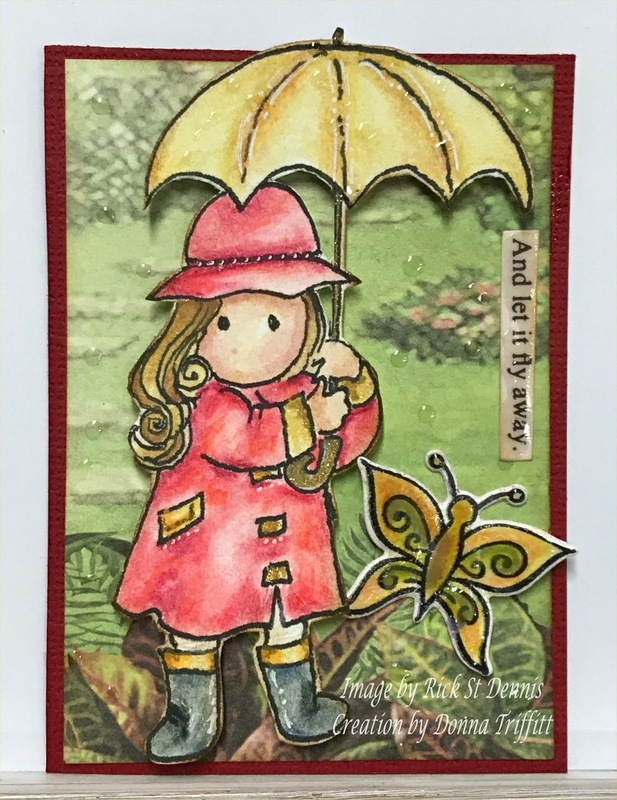 I named this topper 'And let it fly away'.. 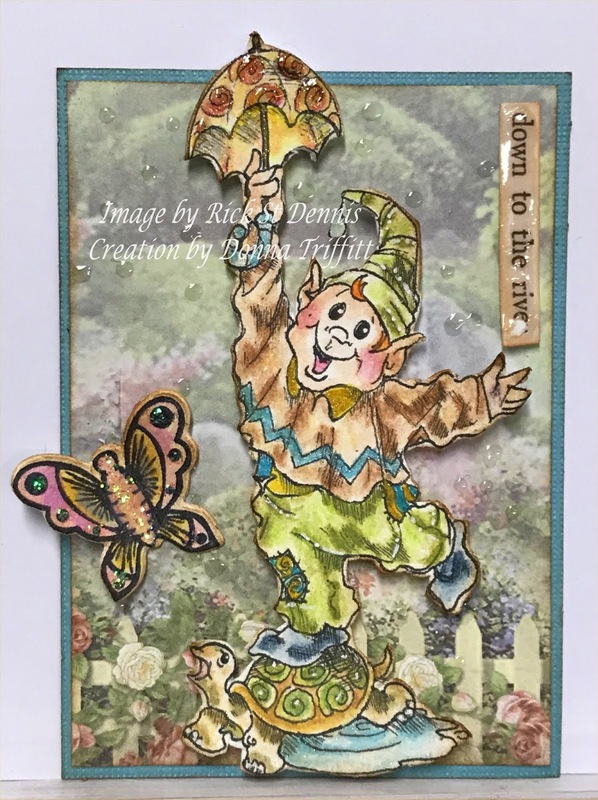 This fellow riding on the turtle is just plain fun.. The little turtle I want to pick up and hold lol I called this one 'down to the river'..
and 'found himself in a strange land' trying to get the bird to land on his hand lol.. Loved colouring his highness in..
'Singing in The Rain' here and how much fun he is having doing it.. 'Upon a Shore' is where he is walking..
All the digital images together, you have to admit they sure are wonderful.. 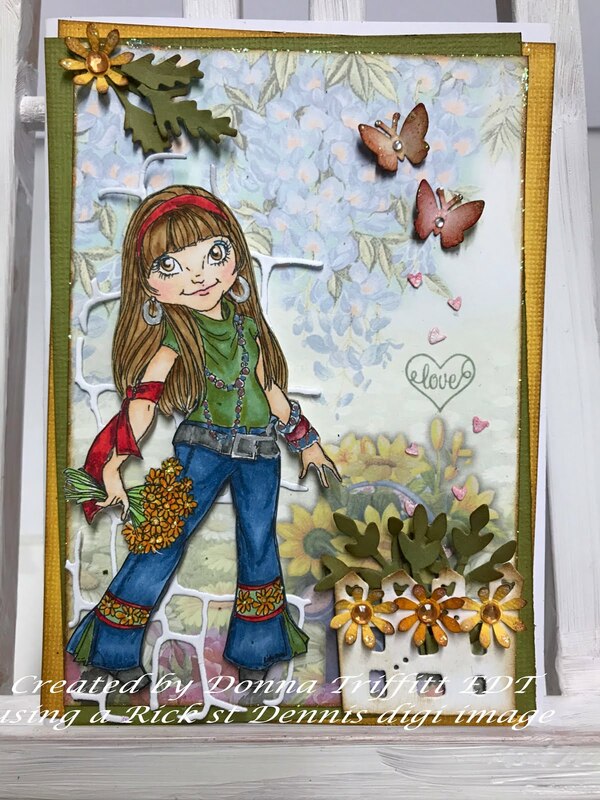 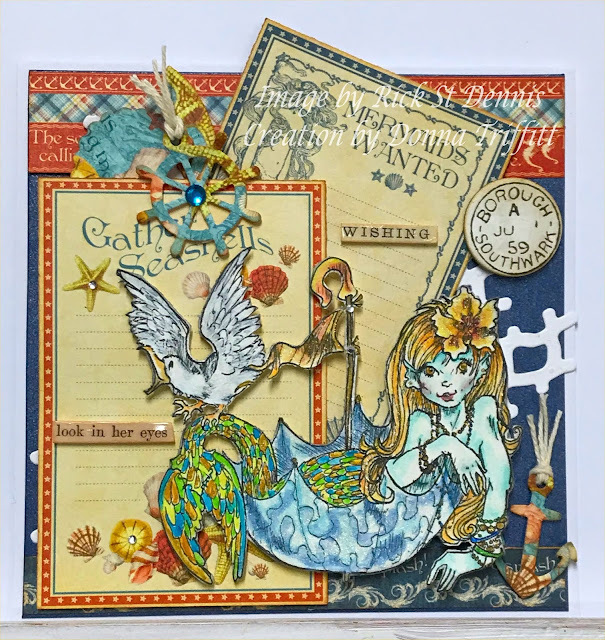 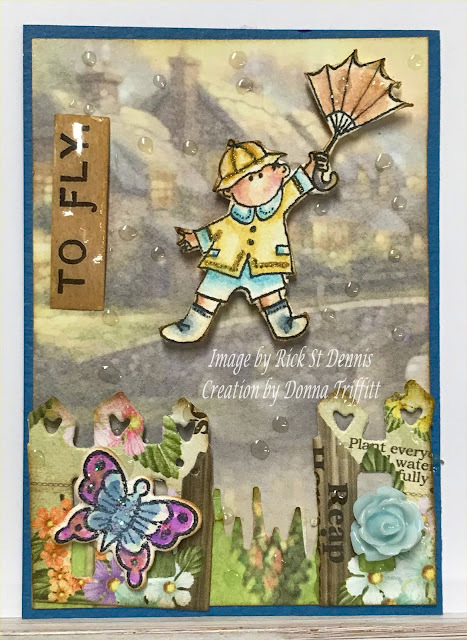 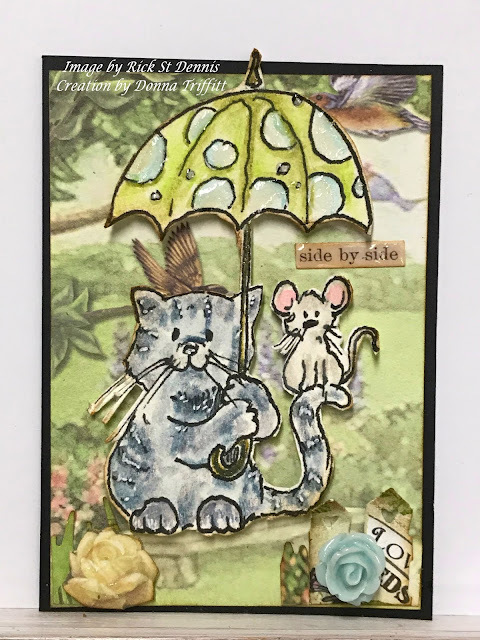 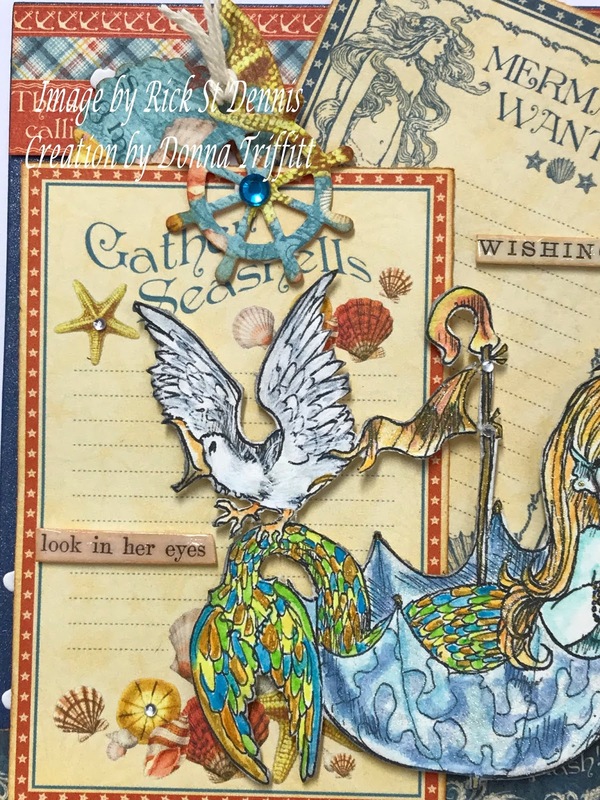 I have a gorgeous digital image by Rick St Dennis and look what I created with her..
Graphic 45 papers and a Netting die by KaiserCraft is all you really need for this little mermaid..
Coloured in watercolour (Distress Ink) and a little die-cut wheel and that's it.. 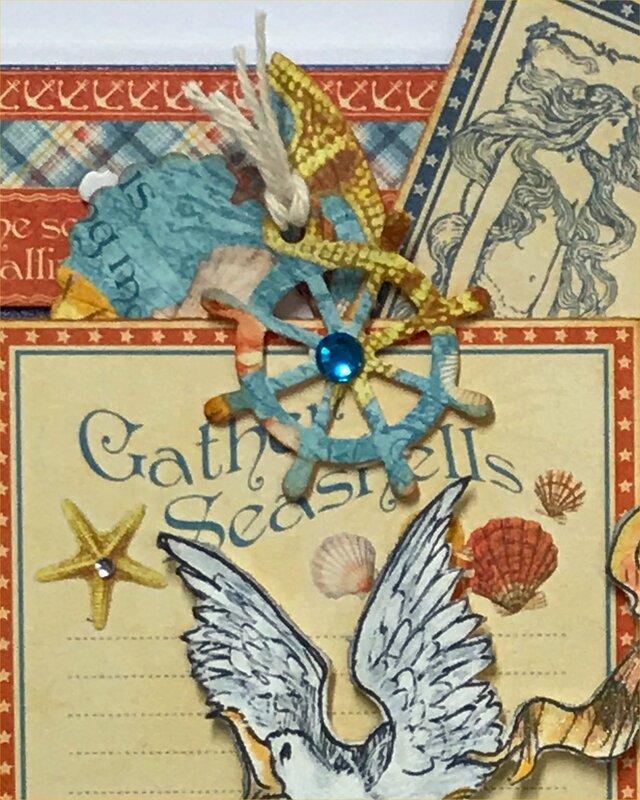 I love this little seagull..
Today is the day I have my unboxing of the April Kit from Aunty Vera Scrap and Craft.. 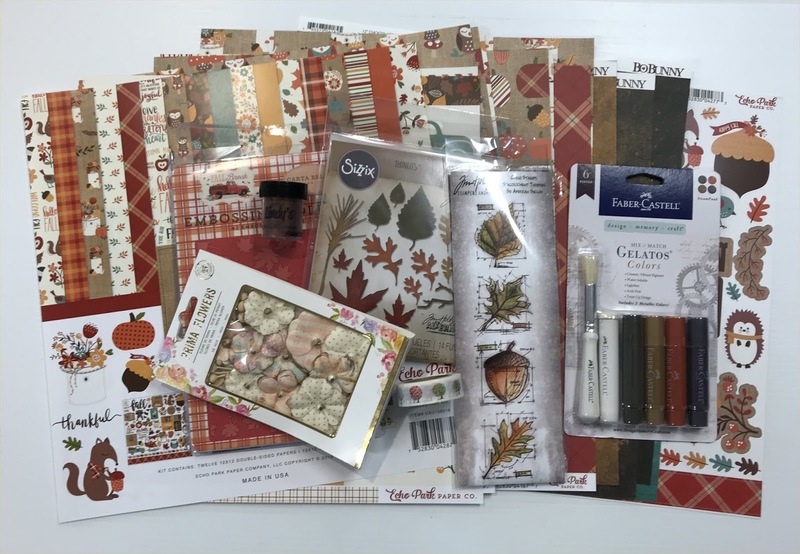 I have to be honest, this is a gorgeous kit with all the wonderful colours. I am adoring these papers from the March theme 'Your Cloud's in My Sky'. 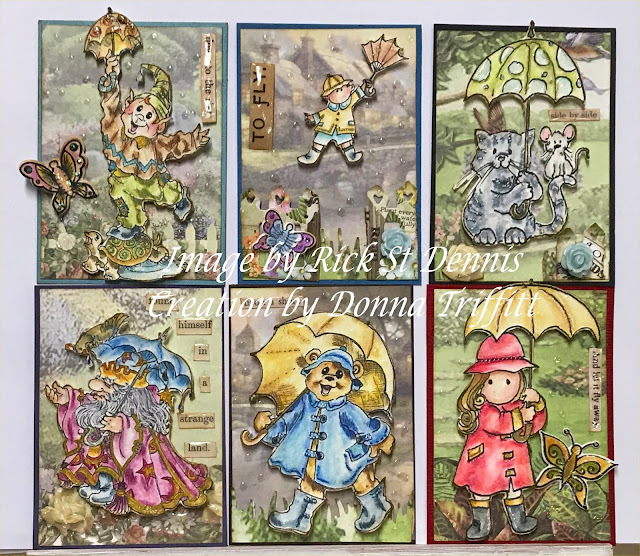 I thought I would create eight ATC's to go into the ATC box I created in my last project for March with Aunty Vera Scrap and Craft. (I do hope you liked it). 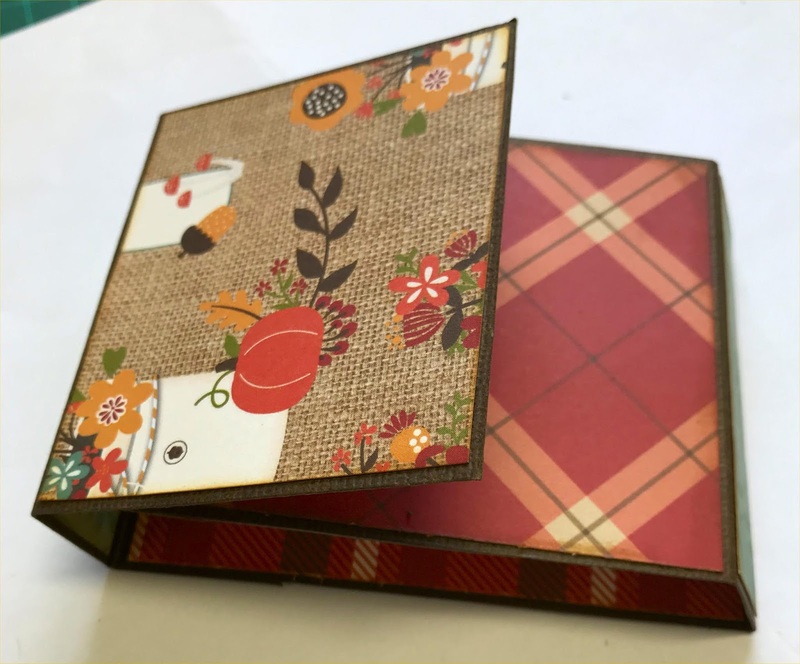 ATC stands for Artist Trading Card and they measure at 2 1/2 inches wide x 3 1/2 inches long. 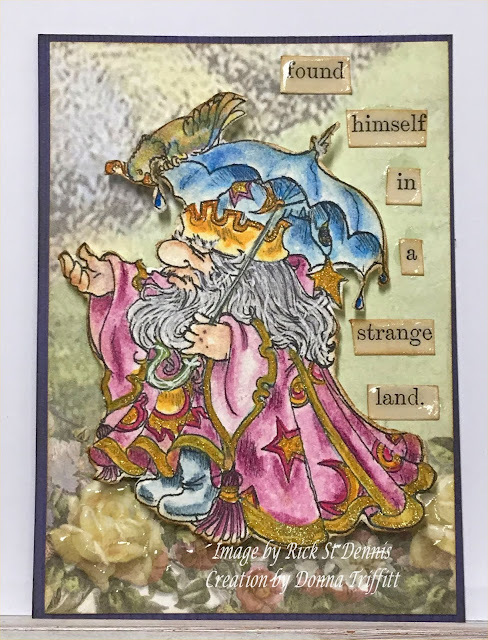 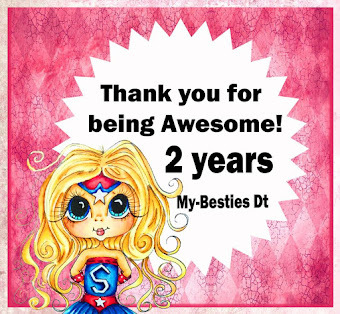 I love creating these and am in assorted swap groups. 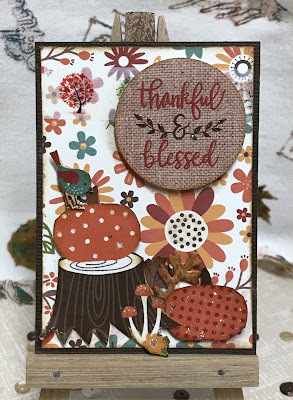 at 2 1/4 inch x 3 1/4 inch..
Mats adhered to the base of the ATC. 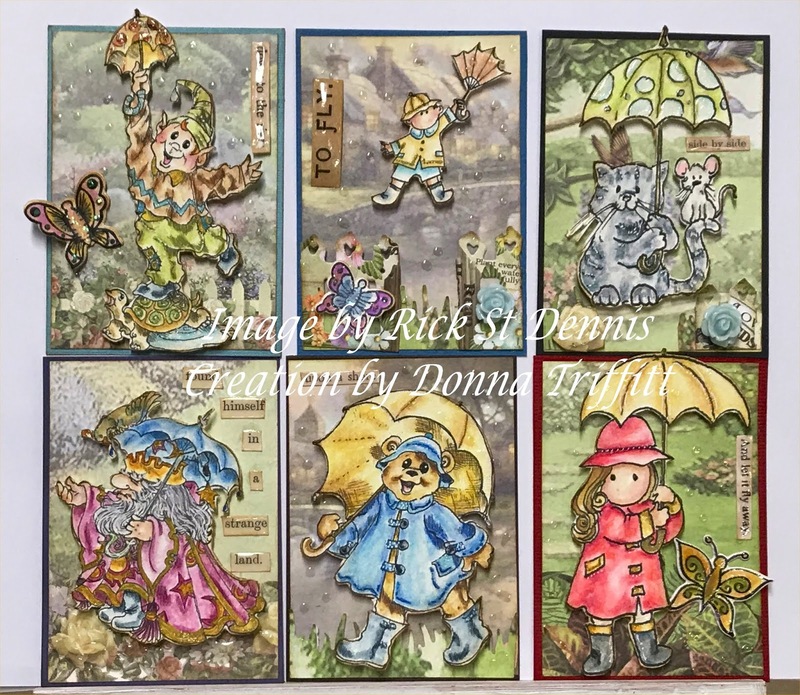 I won't go through on how I created these ATC's as they all follow the same idea.. On each of the ATC's I have placed a strip of the Trees on the Avenue washie tape Here on each front.. 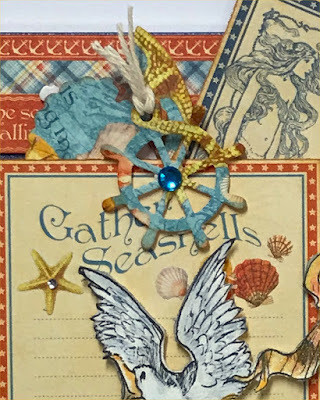 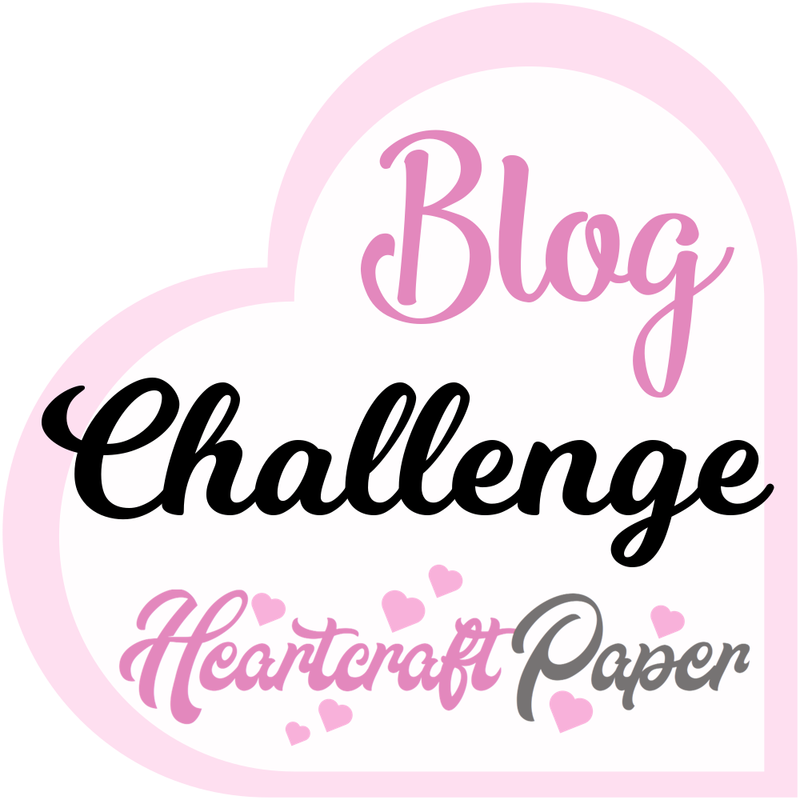 Using the scraps of the papers I created for background interest.. I fussy cut images from the papers and using 3D foam tape placed them on the mats..
Kindy Glitz to give a little sparkle, after all what is Autumn without sparkle ..
Carta Bella - Fall Break - 12x12" Sticker Sheet - Elements Here is such a gorgeous one, that for this project I used quite a few.. 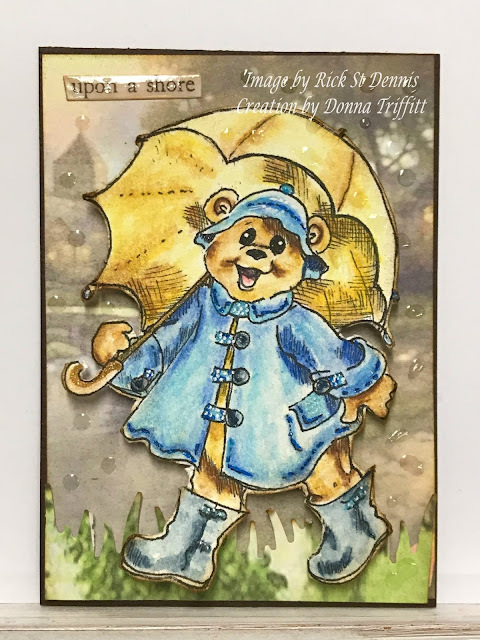 I did ink around the edges first as it was too white otherwise.. I punched a flower from the paper and a smaller one to place on top of it with 3D foam tape.. 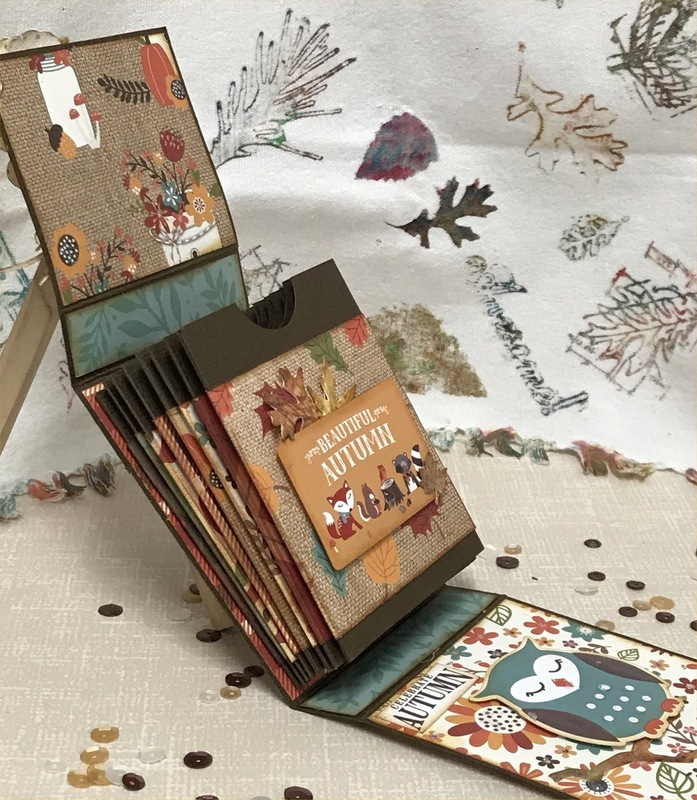 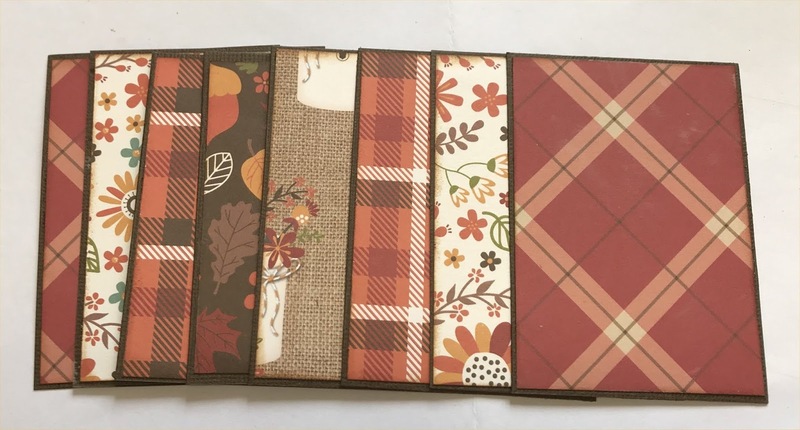 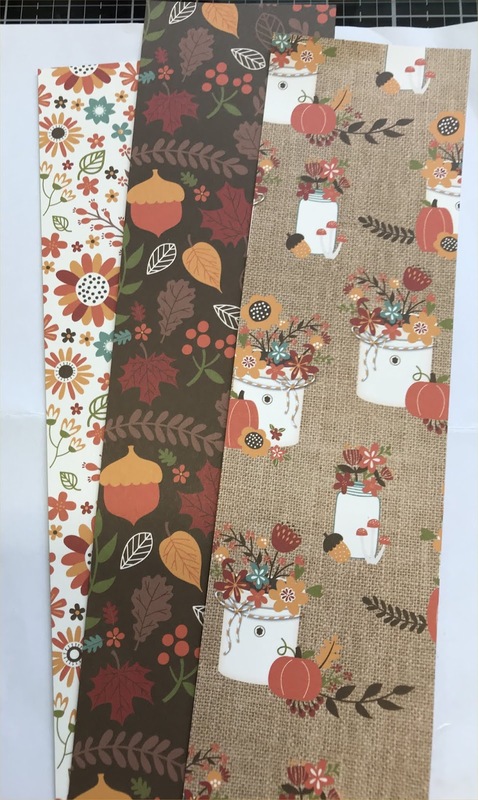 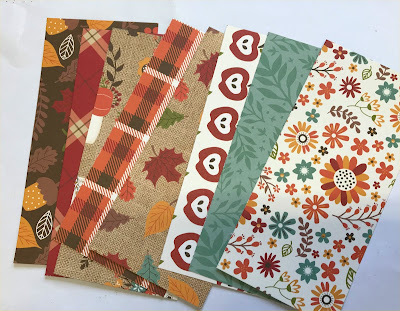 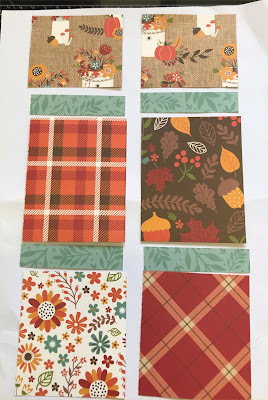 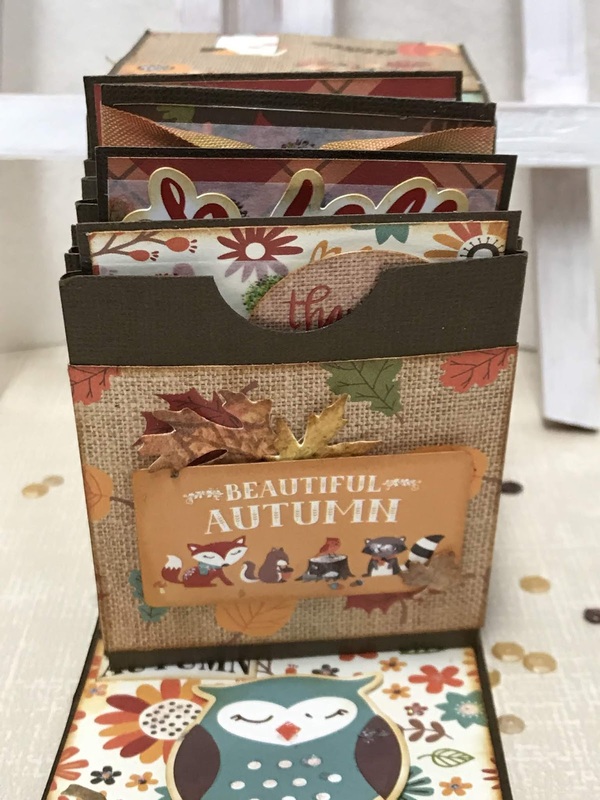 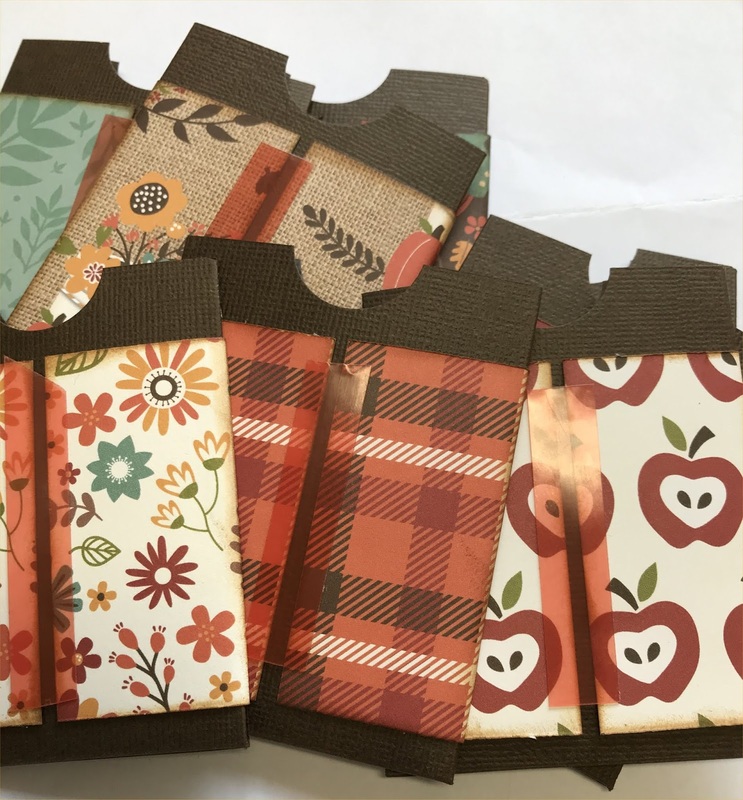 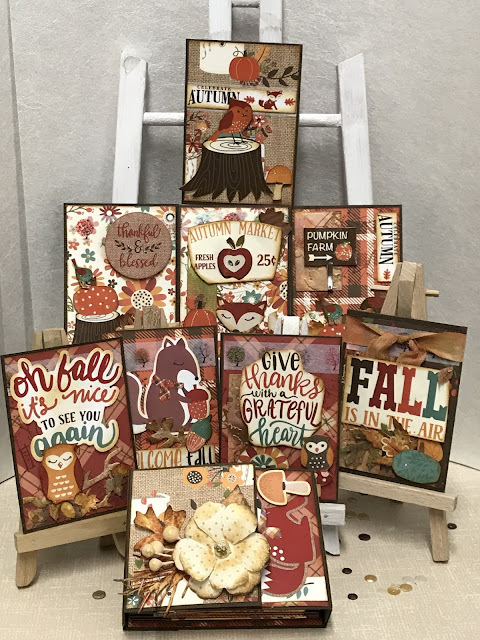 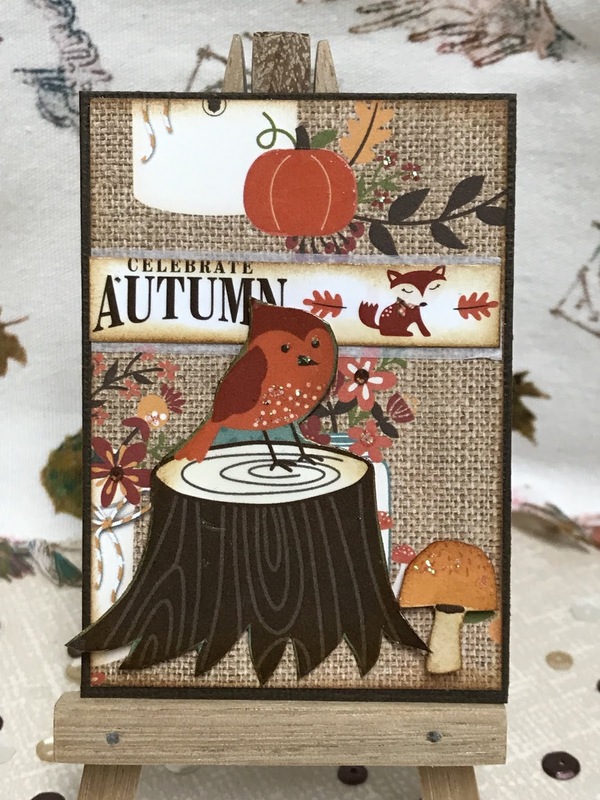 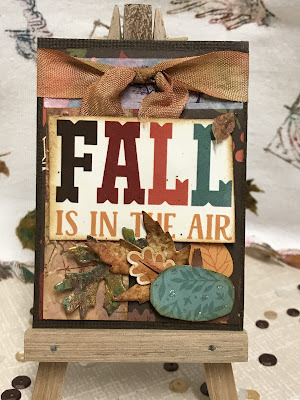 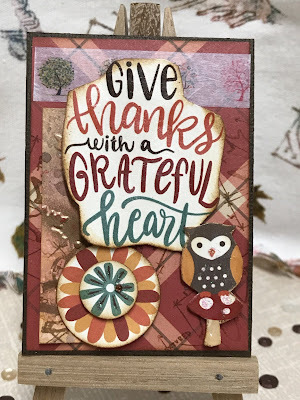 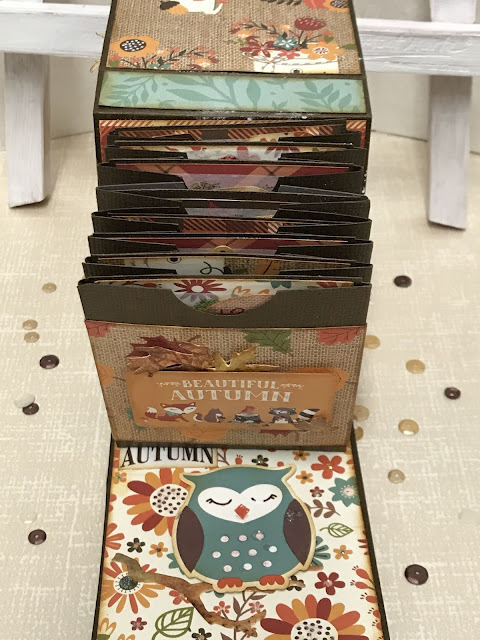 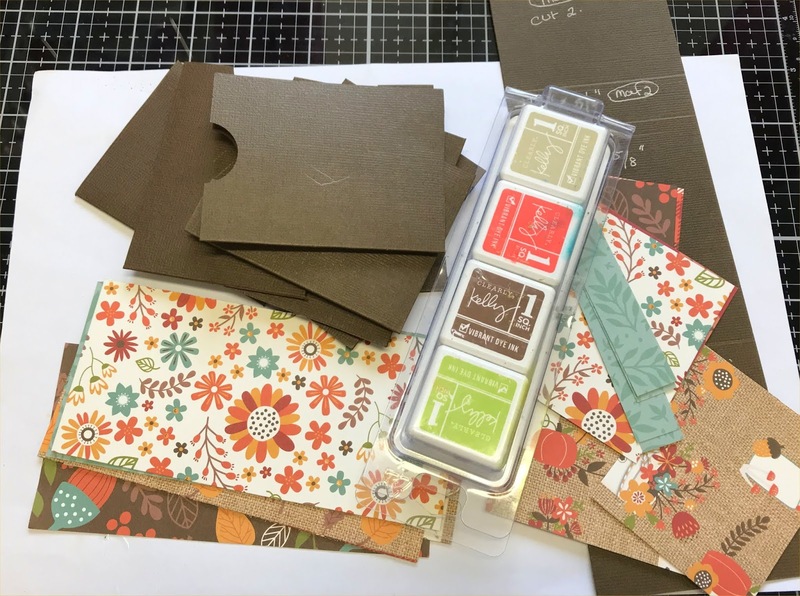 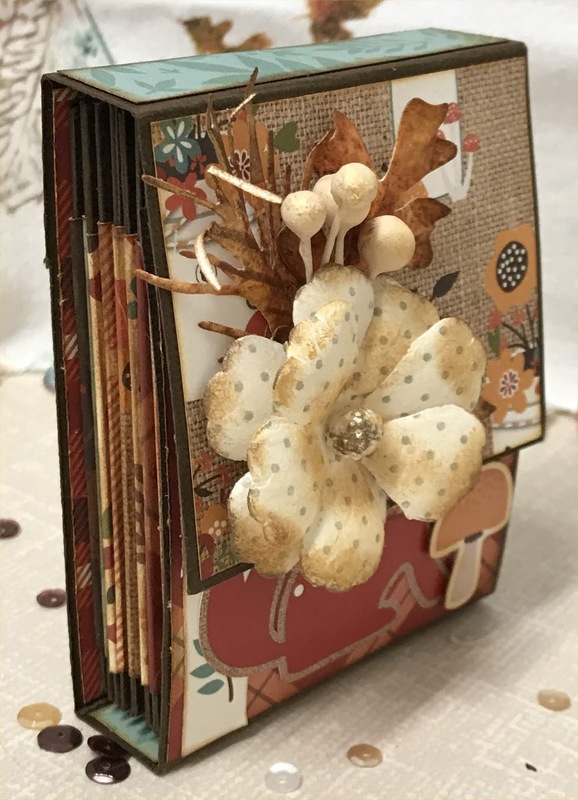 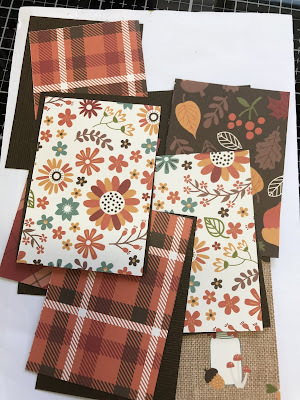 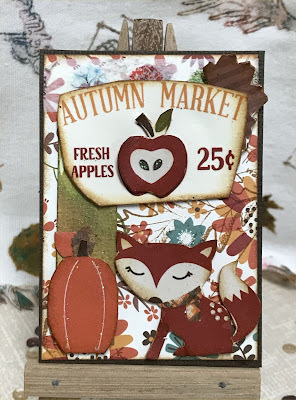 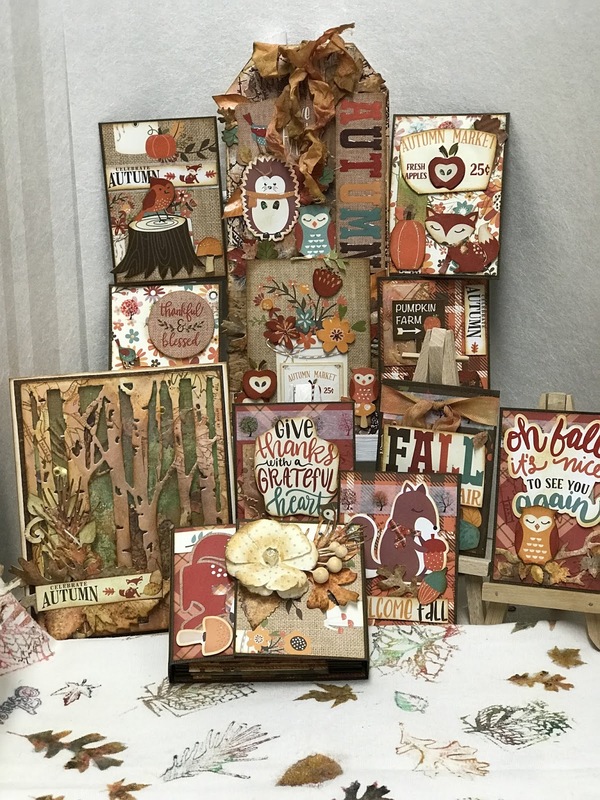 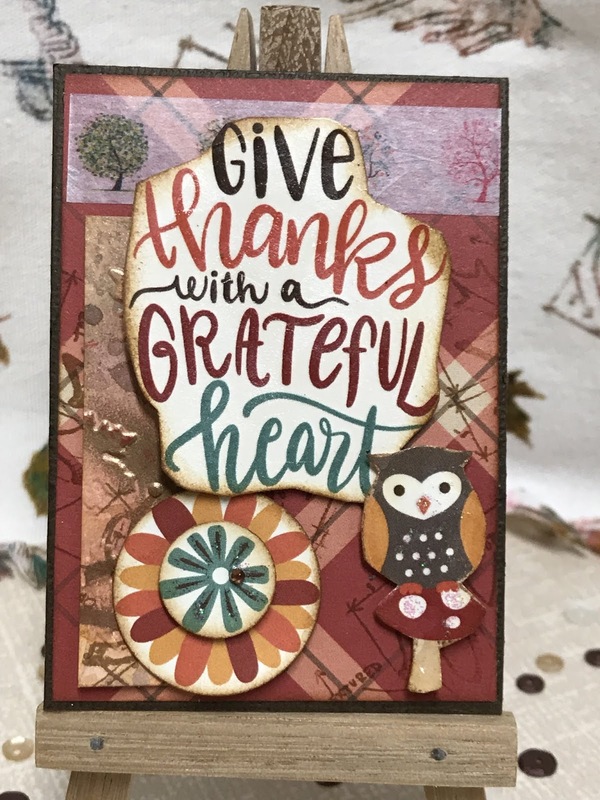 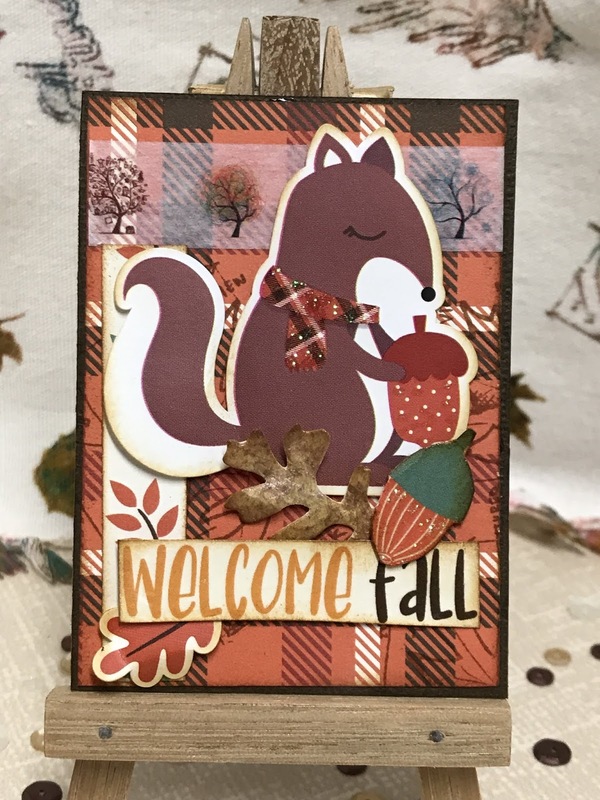 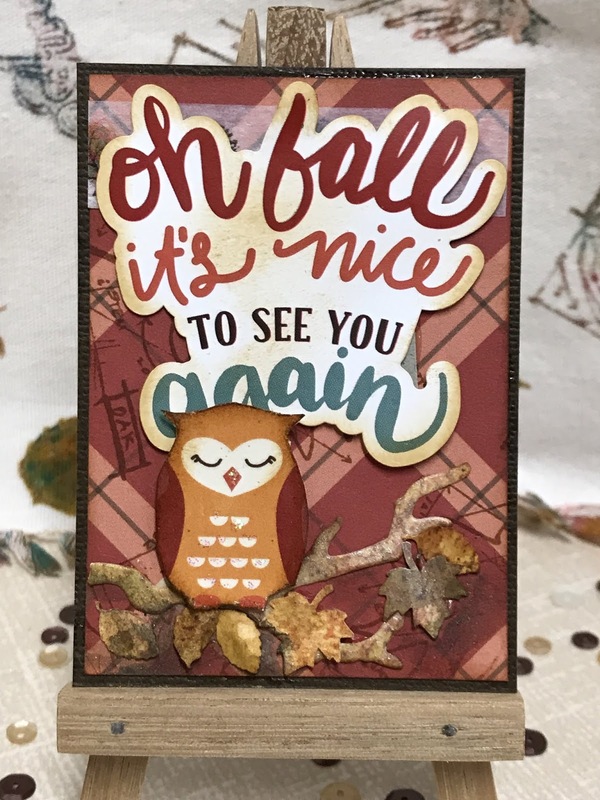 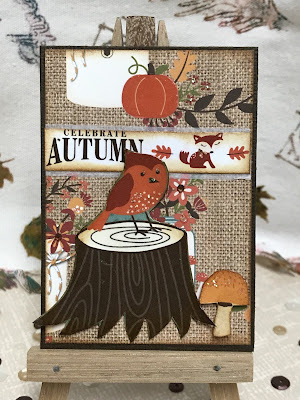 I just love how the bias binding turned out with the Autumn colours.. And them gorgeous Autumn leaves from that paper I created just made this ATC perfect..
We call Fall, Autumn in Australia but in all honesty it means the same - lushiness colours.. 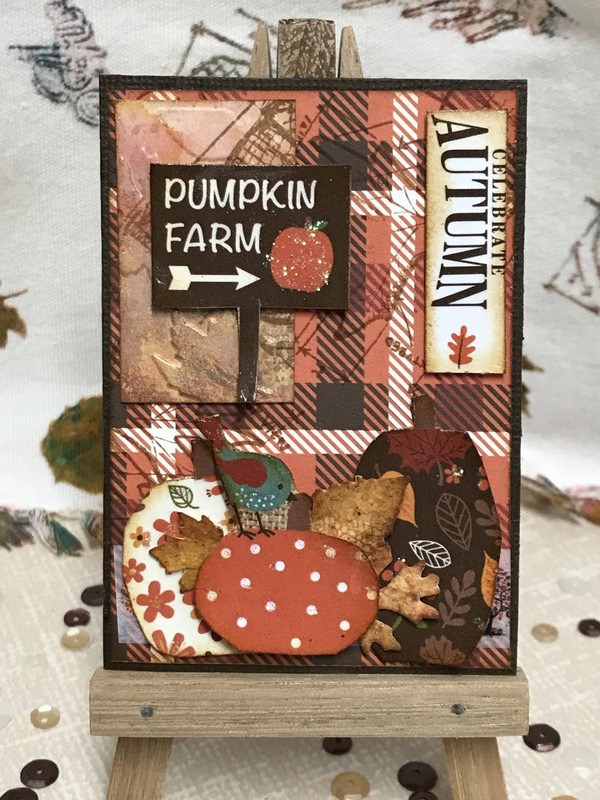 The ATC's together with the ATC box I created.. The box opened with the ATC's inside.. 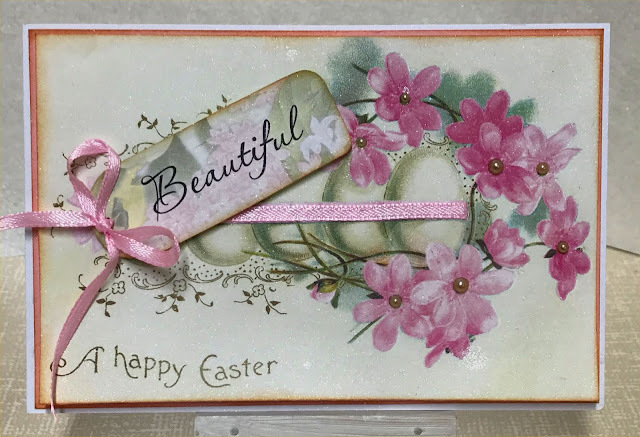 The box shut with all the goodies inside ready to gift them..
and all the ATC's to fit in the box.. I have another project for you using this gorgeous collection of papers from the Autumn March Theme Which I love to bits.. For this project I made a ATC Box which holds 8 ATC's.. And yep that is another project entirely, coming soon..
Cut brown cardstock at 3 inches x 11 inches and score @ 2 1/2 inch, 3 1/4 inch, 7 inch, 7 3/4 inch. 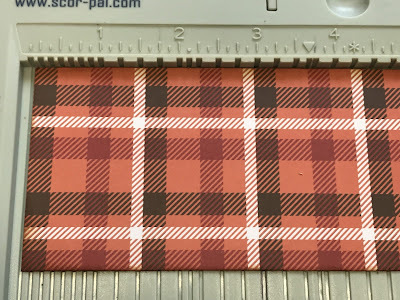 Cut three strips of patterned paper @ 2 7/8 inch x 12 inches. These will be enough to decorate the base with leftovers for the ATC 's.. I do cover the front and back of the base as it does look good when finished.. 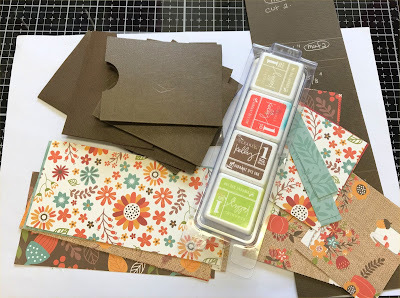 Using the green strip brings the book together with the papers.. 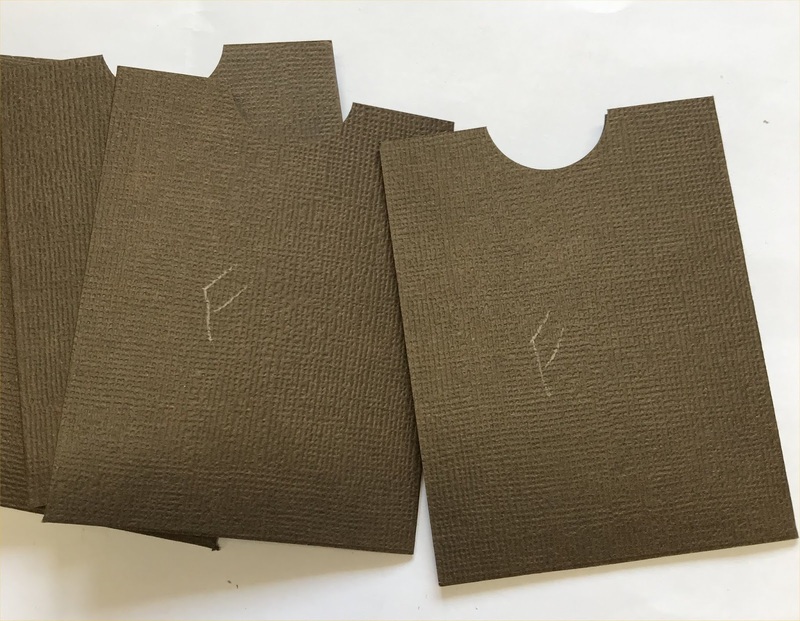 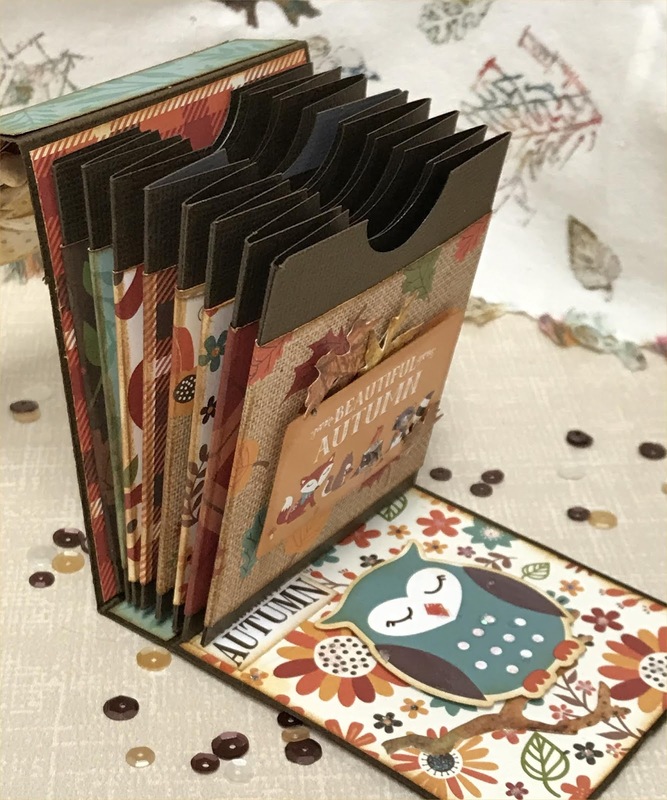 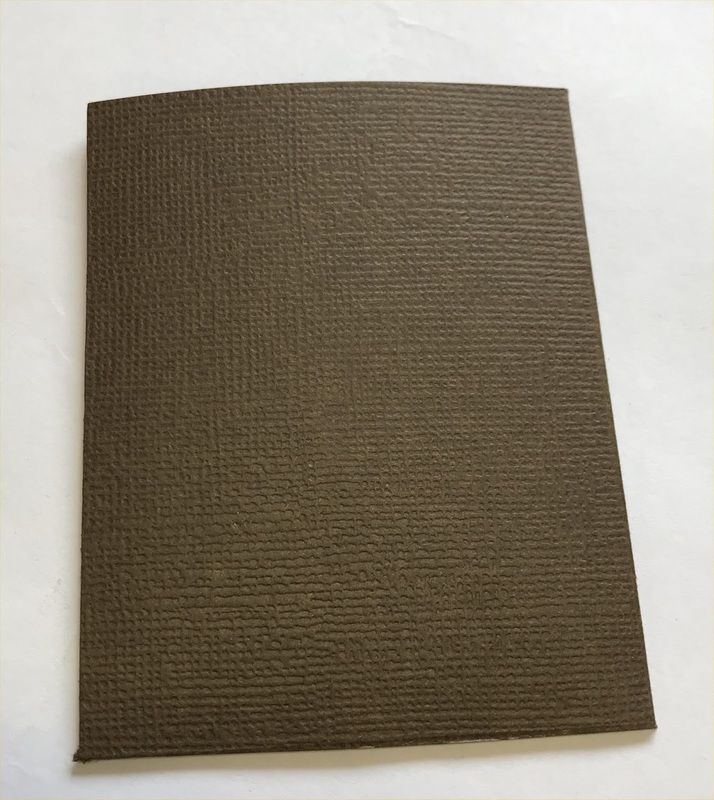 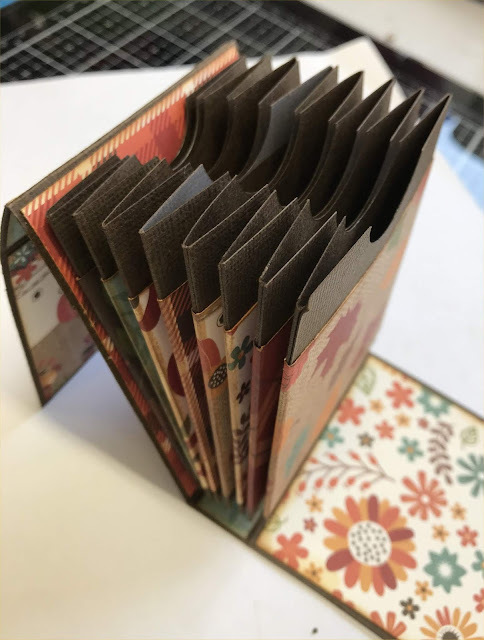 The book folds as shown..
Cut Eight pieces of brown cardstock @ 4 inches x 6 inches and score @ 2 3/4 inches, 5 1/2 inches, turn once and score @ 1/2 inch. 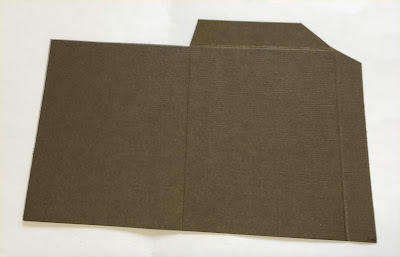 Trim as shown..
Place strong tape on the flaps and fold as shown.. 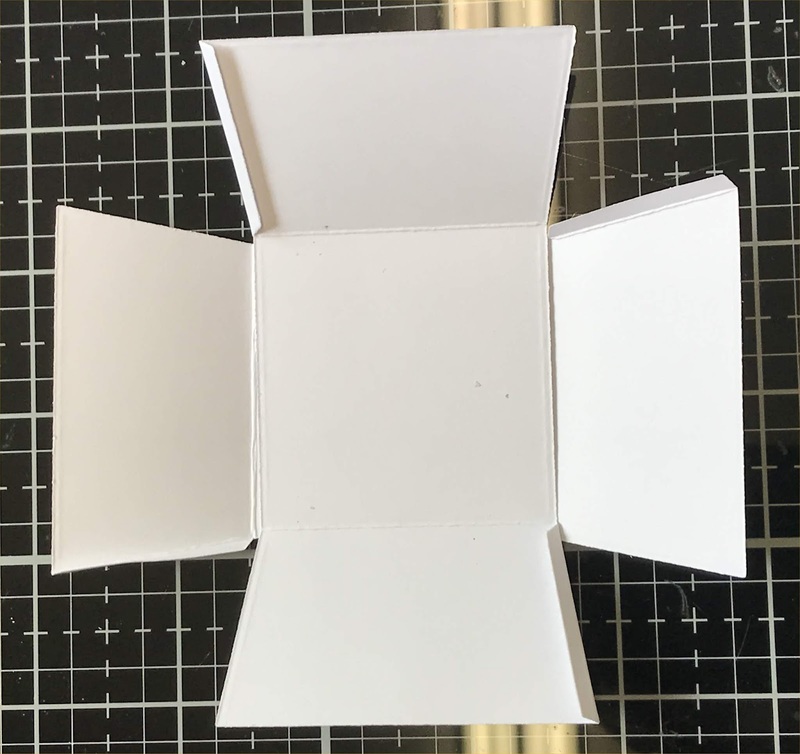 Fold over the side and voila, a pocket.. 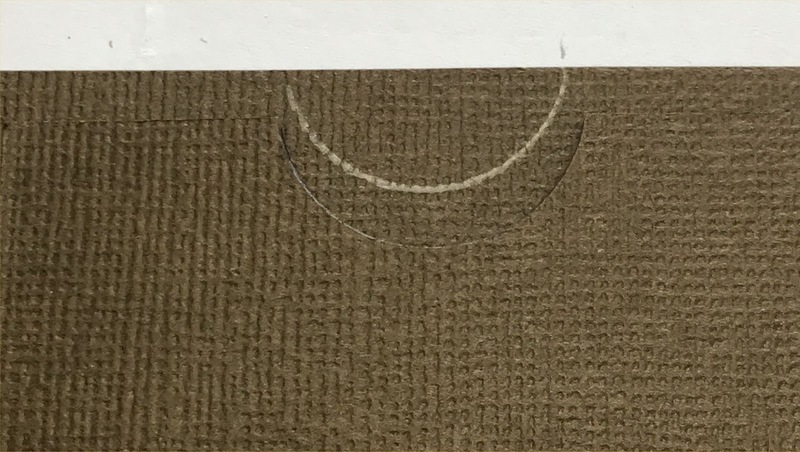 Using a one inch punch cut a half circle from the pocket at the top.. 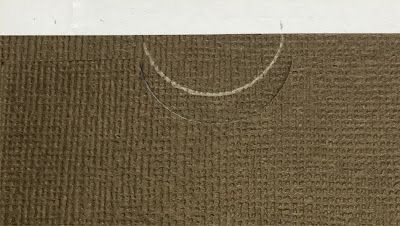 Note: To get all circles even, I trace around the first pocket with a pencil mark as shown on all the pockets.. (I have moved the first pocket down on this photo so you can see what I mean)..
Then using the one inch punch cut just above the drawn half circle as shown, they will all be straight that way and match.. I simply drew a F on my pockets for the front..
Cut eight belly bands @ 2 5/8 inch x 5 1/2 inch and score 1 3/8 inch, 4 1/8 inch. 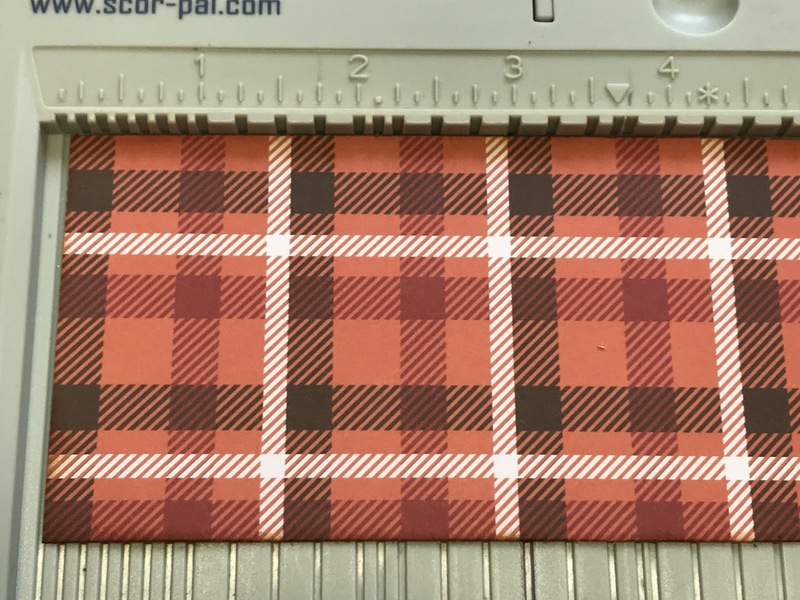 1 1/2 inch x 4 1/4 inch..
Wrap the belly bands around the pocket meeting up at the back. 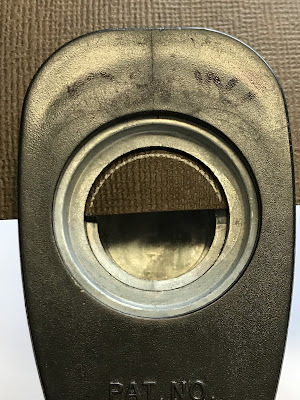 There will be a small gap so don't panic you didn't cut it wrong.. 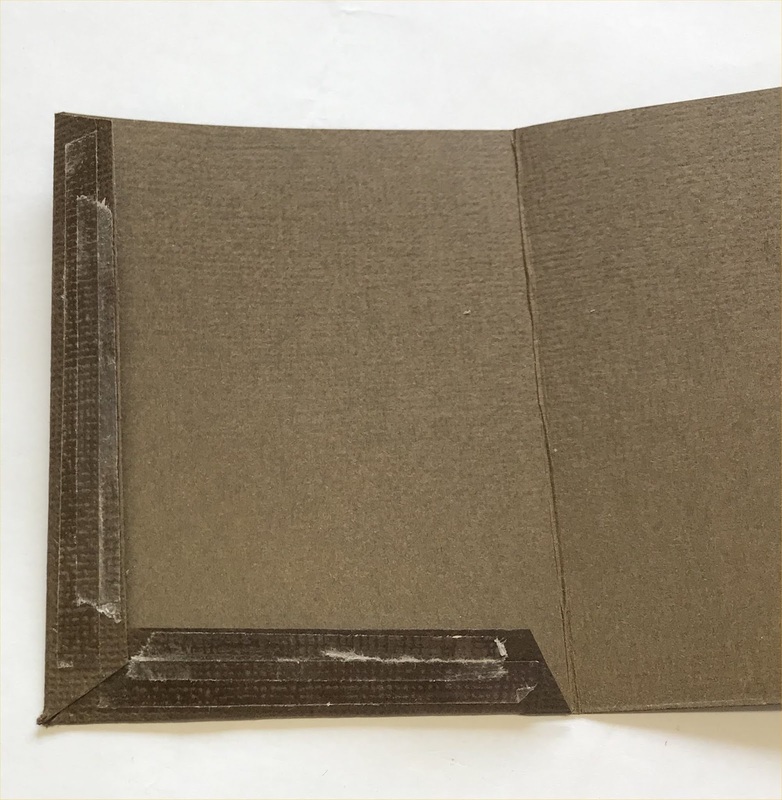 This saves bulk when adhering together..
Adhere the pockets together back to front of another pocket; on the last pocket add more sticky tape so it adheres to the back of the box as shown.. The book opened fully.. I used the leaves I made from the start of the month. 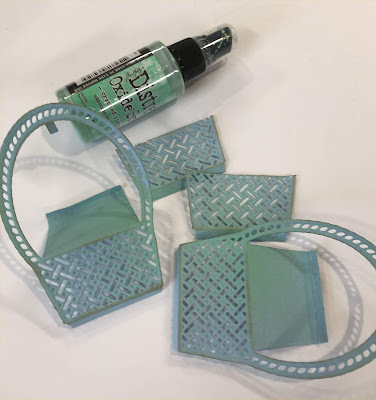 The stickers from the sticker sheet included with the March paper collection kit are popped up with 3D foam tape to give a little dimension.. I used a small magnet for the closure of the book..